The Kingcombe Centre is nestled in the heart of 450 acres of stunning nature reserve within the ancient West Dorset landscape of rolling hills, woodland and wildflower meadows. The Centre runs workshops and courses with accommodation for visitors from further afield to enjoy, and a programme of walks and events throughout the year. Visitors can enjoy delicious light refreshments in the Kingcombe Café and its wildlife garden. Pick up a trail map and explore the flower-rich meadows and ancient woodland. 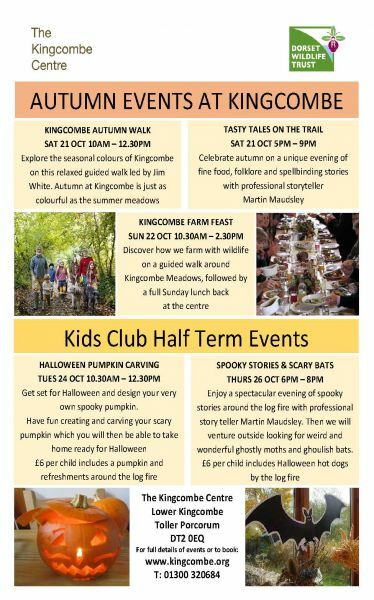 The brochure is packed with a great range of naturally inspired creative workshops, conservation and natural history courses plus a range of seasonal events - see www.kingcombe.org for full details and opening times.